Minot’s Ribfest Kicks Off Today! You are here:Home2018 Minot’s Ribfest Kicks Off Today! Author North Dakota State FairPosted on June 15, 2018 June 15, 2018 No comment Minot’s Ribfest Kicks Off Today! Minot’s Ribfest is ready to rock the Fairgrounds, June 15, 16, & 17. Concerts, food, and fun, are planned for the summer festival hosted at the ND State Fairgrounds. Wristbands for the festival will be $5 per day and will include the entertainment in the evenings. On Friday, June 15, the Ribfest gates will be open with free admission from 11am – 3pm and the ribbers will be offering free sides for the Friday lunch hours. Enjoy concerts from Soul Shine at 5:30 pm and The Front Fenders at 7:30 pm on the iHeart Media stage. On Saturday, rock out with All Aces at 5:30 pm and a Doobie Brothers & Santana Tribute Show at 7:30 pm. The Pursuit Church of Minot will bring its Father’s Day Service with special music to Ribfest on Sunday at 11:15 am. There will be free admission during the church service. The World of Outlaws will be tearing up the racetrack on Sunday, June 17 at 7:30 pm. Purchase a Magic City Showdown race ticket in advance and you’ll get one day free admission into Ribfest. The Magic City International Drag Way is also offering a special discount to Ribfest attendees. Wristbands purchased on Friday or Saturday can be used for half price admission to the Saturday Drag Race at the Magic City International Drag Way. In addition to great food and music, a corn-hole tournament, kids’ bounce houses, Escape Room, mini golf, basketball, and more are being planned for this fun filled weekend. The festival will feature tons of bounce houses for $10 per day and come show off your classic car on Friday at 4 pm during the classic car show. Plus, learn how to build a kite with Nature’s Nook Kite Building Class at 1pm on Saturday. 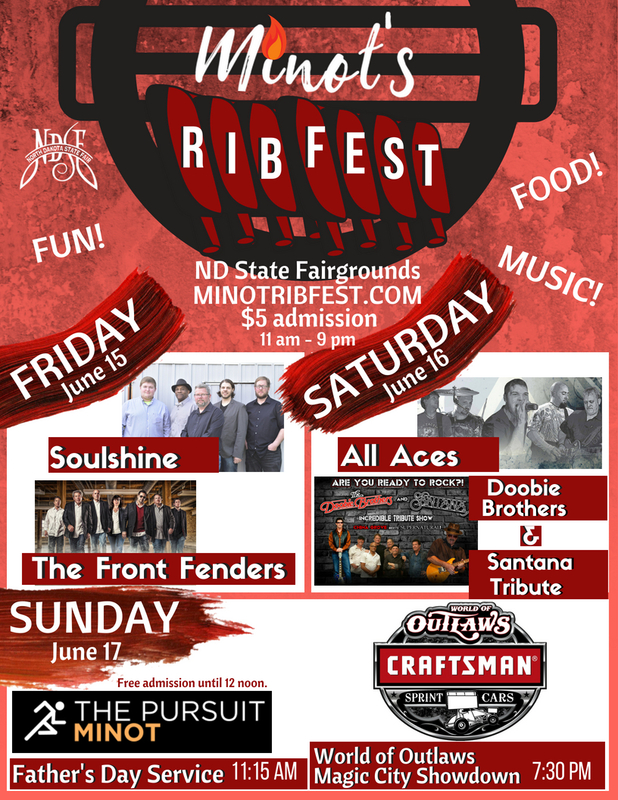 There will be something for everyone in the family to enjoy at Minot’s Ribfest, June 15, 16, & 17 at the ND State Fairgrounds.